Hello and welcome to this demonstration on using PASS, the market leader in power analysis and sample size software! In this video we’ll show you how easy it is to perform a sample size calculation with PASS. PASS includes a comprehensive list of power analysis and sample size procedures. For this demonstration, we’ll calculate sample sizes for the Two-Sample Equal Variance T-Test. To locate the procedure using the category tree, expand Means, then Two Independent Means, and then click on T-Test. The procedure window makes it easy to set up this calculation because all of the options are located on a single input screen. As you mouse over the various options, the help pane provides in-depth information. If you’d like more help, expand the Help Center. The Help Center contains links to online training videos and the procedure documentation. Each procedure in PASS is fully-documented, with technical details, examples, and validation! We’ll now specify the input parameters for a simple sample size calculation according to an example study design. PASS requires that you enter at least one value for every input parameter. In this demonstration, we’ll enter a range of values for most of the parameters to demonstrate how easy it is to generate sample size tables and graphs in PASS. First, choose the parameter to solve for based on the other input parameters. In this example, we’ll solve for sample size. Let’s leave the hypothesis test direction as two-sided, the default value. For Power enter 0.8 and 0.9 to calculate the sample sizes required to achieve 80% and 90% power. Leave alpha at 0.05 and assume equal group sample size allocation; both are the defaults. For delta, let’s enter the values 5 to 10 by 1 to investigate a range of detectable differences. For sigma, enter the list 10 20 and 30 to study a range of plausible group standard deviation values. We’ve entered all the information needed to perform this sample size calculation. Now click the green Calculate button to get the results. The report is displayed in the output window. The Numeric Results Section reports the sample sizes required to achieve 80% and 90% power for each combination of the other input parameters. The required group sample sizes range from 17 to 757. Since the report is lengthy, use the navigation pane to quickly jump to various sections in the report. The Sample Size Charts provide a graphical representation of the numeric results. As expected, the required sample size increases with the standard deviation and the desired power. The impact is much larger for smaller group differences than it is for larger differences. Double-click any graph to enlarge it. All plots can easily be saved to any one of several file formats. We can also save the entire report, or easily copy and paste individual sections into a document or presentation! As you can see, it’s easy to perform sample size calculations in PASS... and power calculations are just as simple. 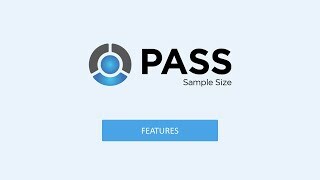 PASS is powerful, comprehensive, and easy-to-use… and if you ever have any questions, our support team of Ph.D. statisticians will be happy to assist you!